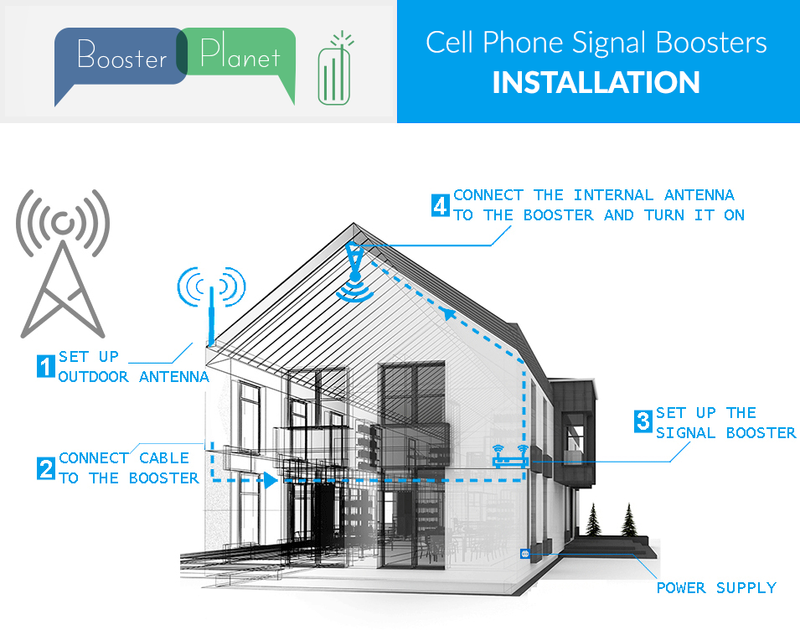 Cell signal booster installation is very simple. Just follow the simple installation steps provided. Whichever product you purchase, the installation is same for all products. Step 1: Set the outdoor antenna at the place where you have the best signal (as high as possible; direct it to the location of the operator’s base station). Step 2: Use the cable to connect the outdoor antenna and the repeater. Step 3: Connect the indoor whip omni ceiling or wall antenna directly to the repeater. Step 4: Plug into the power supply. The repeater should work immediately, giving you , 5 bars of mobile signal! If the present “ground” mobile signal is 1-2 bars, check how many bars you have in higher location. Go to the roof and see if there is little change. We recommended placing the antenna higher (such as 3-5 meters) as demonstrated in the photo below. Never plug the power supply in first. You must confirm that the antenna and cable are connected well first, otherwise the repeater may be damaged.